Few weeks ago, I went to see a play at the Cherry Lane Theatre in New York. But it was not one of the typical off-broadway productions that you expect to see at such a venue. It was one of the well known modern plays of India, “Adhe Adhure” by Mohan Rakesh. 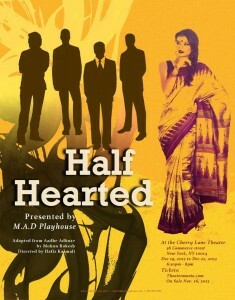 The play was, of course, staged in English as “Half Hearted” and had a very short run of four shows. But the cast and the crew put in all their heart and soul to present a wonderful production which touched the audience. After the play, I invited the production team to join me at the EBC Radio studios and have a chat about their dreams, visions and their passion for South Asian theatre. Here is a recording of my conversation with Samir Lal, Dipanjan Chatterjee, Prince Vaghani and Akshay.